“THOZHAN” (a social reforming group) are into the Road safety awareness campaigns among people in Chennai for the past 26 months. 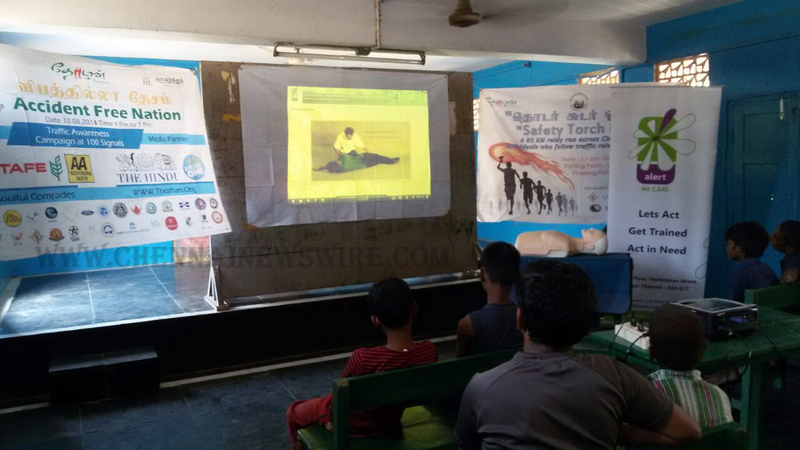 As a part of our leaders mentoring program, we used to have a “Knowledge sharing day” every month, to share information on road safety and its pertaining areas to gain knowledge and groom ourselves. “Everybody should have some level of first aid ability, because accidents and medical emergencies can happen anywhere at any time”. The session was presented by Expert Trainers (Karthik and Abdul) from “Alert Team” on First Aid in Accident cases, Emergency rescue, Bone Fracture ,Fire Injury , Poisonous Animals , Electric shock ,.. was discussed and understood. They added in emergency cases what to do and what not to do. The topic was serious in-spite of that The session was absolutely more interactive ,Efficient , Humorous, extensive, informative, practical and Statistical,they covered so many topics in less time. It was sad to know that people were taught wrongly about first aid treatment by myths, boon and cinemas. It was very helpful to hear about participants and trainers, personal experiences on first aid at Emergency situations in their life. CPR (Cardio-Pulmonary Resuscitation) & CAB (Circulate, Airway and Breath) was great part of all…. Overall the event was very informative and useful to the participants. Let’s learn more to be aware of all the stuffs to help others. Had awesome day !